Ah, June! School is out, the days are longer (and warmer! ), summer vacations are being planned, and lazy afternoons by the pool (or at the beach) stretch well into the future. Summer usually means get-togethers: beach parties, camping excursions, pool parties, or even just long evenings outside with a full cooler, some folding chairs, and a few friends and neighbors. 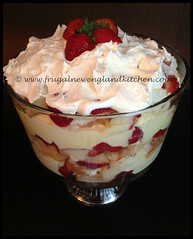 If you want your dessert to look fancy and time –consuming (even though it isn’t), make parfaits (or one large trifle). You’ll need individual parfait cups (this is the best way for a small gathering of about four to six people) or a trifle bowl. A trifle bowl resembles a tall, clear vase and will feed a larger crowd. The concept is the same – layers of something cake- or cookie-like and something more pudding-like. Here’s a fun recipe: Take a package of cream cheese, softened (if you are making a trifle, double this recipe) and beat the cream cheese in a mixing bowl with a cup of confectioners’ sugar. Gently fold in about one and a half cups of whipped topping. Set this aside. Prepare a package of pistachio pudding mix (3.4 ounces) according to package directions and set this aside. Crumble up about 10 shortbread cookies. Now, layer the ingredients in the parfait cups (or in the trifle bowl): A spoonful of the cookie crumbles, half the pudding mixture, half the cream cheese mixture. Repeat until the cups are full and sprinkle remaining cookie crumbles over the top. Bikini season have you swearing off desserts? Don’t worry – you can make delicious, healthy ice pops with fresh fruit – and even vegetables. Take some cucumbers and julienne them (cut them into long, thin strips so they resemble shoestrings) and set them aside. Juice a lemon and remove seeds. Add two cups of cold water and a little honey or agave (or a natural sweetener of your choice) and mix it with the lemon juice and two cups of water. Pour the lemonade into Popsicle molds to about 2/3 full and freeze (without the sticks and uncovered) for about an hour. Take the pops back out of the freezer and scrape any ice aside. Add a spoonful of the cucumbers to each popsicle. Using the popsicle sticks, push the cucumbers gently into the lemonade mixture to distribute it evenly. Add the sticks to the popsicles and place back in the freezer for about three hours or until they are solid. Quick, easy, and cool desserts are great summertime treats for all of those picnics, poolside get-togethers, and family reunions. Make one of these summertime treats for your next event and be the hit of the party!